Introduced in early 2014, the Nikon D3300 is a camera that made for people who want a powerful camera that is capable of doing well while also being light in weight and easy to carry around. This camera has an impressive series of features that are capable of taking quality images in as less time as possible. The D3300 has a brilliant sensor that takes in detailed images. It also records 1080p videos quite well. It can even link to other devices to share photos as needed. It, in turn, establishes a powerful setup that isn’t too hard to utilize. The sensor features on the Nikon D3300 include a 24.2-megapixel resolution. It offers a detailed image that is easy to see. It also works with 5fps of continuous shooting power to create a better image. The ISO can work from 100 to 12800 and could expand to 25600 as needed. The sensor is organized properly with a brilliant arrangement that offers a detailed image that is certainly going to look great. It also works with 1080p video images at about 60/50/30/25/24p to create a detailed look. The sensor can operate with many photo options. It can work with panorama and guide mode shots and can even support many filters or special effects. These may be adjusted through the menu on the screen located at the back of the camera. The lightweight nature of the Nikon D3300 is a popular feature to see. At 14.5 ounces in weight and just three inches deep, this choice has a powerful style that should be very easy for most people to use. It also works in many environmental conditions as, a user can take pictures in humidity levels of up to 85 percent and at temperatures of up to 104 degrees Fahrenheit. The grip is clearly consistent in terms of how it is organized. It works with a slight grip feature on the right-hand part to create a good grip that is easy to carry around. The rear part of the camera has controls that are clearly dedicated to the screen and the video recording functions. The top buttons focus on simple controls that work for AF, ISO and metering pattern options. The camera offers an AF mode that runs with eleven points and works with a focus lock control feature. It also has various white balance choices with the cloudy, flash, shade and fluorescent options being easy to sort through. The camera also has seven different fluorescent options in it. The detection range can even be adjusted from -1 to 19 EV. The flash feature can also come up or down as needed although, an additional option may be added and mounted on the top if needed. In terms of the performance of this camera, there is a great setup on the sensor that offers a detailed look which is easy to prepare and use. The 24.2-megapixel sensor is a powerful DX-format CMOS image sensor that works with a minimal amount of noise. It operates quickly enough to create a sturdy and appealing image that fits in perfectly with whatever one wants to set up. The three-inch screen offers 921,000 dots of resolution to create a detailed preview of the image. A manual viewfinder is also available on the top. The TFT LCD screen also offers a 100 percent coverage area. It creates a good look that is easy to follow and is simple to use. The wireless connectivity feature on this camera is of particular importance to see. It offers a Wi-Fi link to create a detailed shot. It also works with a WU-1a wireless adapter to create a brighter and more detailed appearance for shots. It, in turn, creates a good look that will stand out quite well. The images of the 24.2-megapixel sensor offer a great setup that works with NIKKOR lenses. This patented series of lenses from Nikon focuses on reducing the total amount of noise that might be generated by the camera. It, in turn, keeps the camera functional and capable of working with a clear setup that is easy to follow. The images may be expanded quite well as needed. It includes support for managing panoramic shots that create more dynamic images. The battery is the last point to see on the Nikon D3300. It is an EN-EL14a Li-ion battery that works with around 700 shots on a single charge. It works well to create enough power for a while with MH-24 quick charger. There are a few different pros and cons that should see while looking at the Nikon D3300 and how effectively it works. Many of these points focus on how well the camera works in many situations. This camera is very light in weight and easy to carry around. The ISO performance allows the camera to take in all sorts of light sources. The autofocus control works rather quickly. The movements on the camera are smooth and good enough for most shooting needs. The video functions work well but it doesn’t work with too many file format options outside JPEG. The battery can wear out quickly depending on the number of functions that may be used. There are not all that many AF points to use here. It takes a bit of time for the camera to work with a noise reduction feature. This is especially the case when working with a longer exposure time. 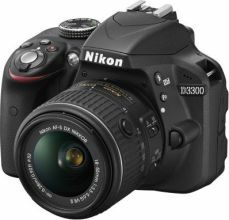 The Nikon D3300 is a great option for all to find when looking for particular DSLR cameras in the market. The D3300 has a good organization that is simple and easy for all to use. It is recommended that people who want a great shot should see what this camera has to offer.